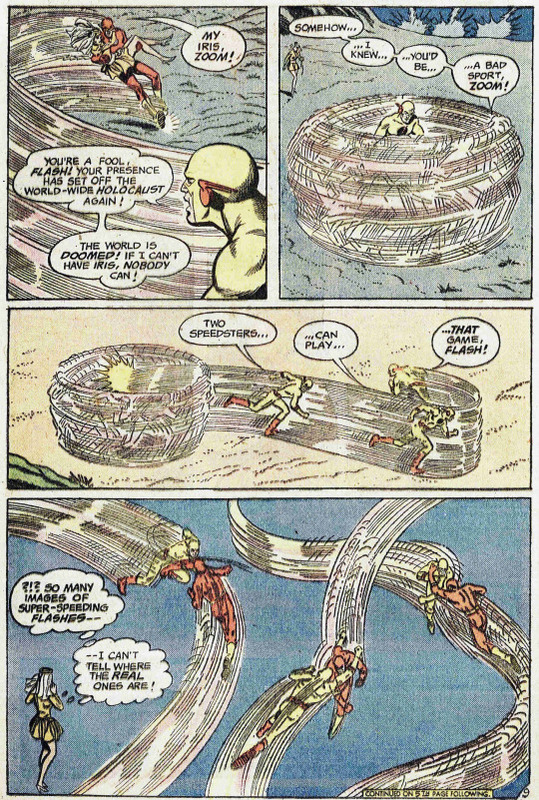 For the third time in a dozen issues, the villain of the day was professor Zoom, the Reverse-Flash. Which I didn’t really mind, I liked Zoom. And clearly FLASH writer Cary Bates liked him as well. This was the issue in which I learned the complicated backstory that had been grafted onto poor old Iris Allen by Bob Kanigher a few years earlier: that she’s really been born a thousand years in the future, and was sent back in time to be raised when disaster threatened her native era. Boy, talk about a strange choice to make–up to that point, Iris had simply been a reporter and a wife. 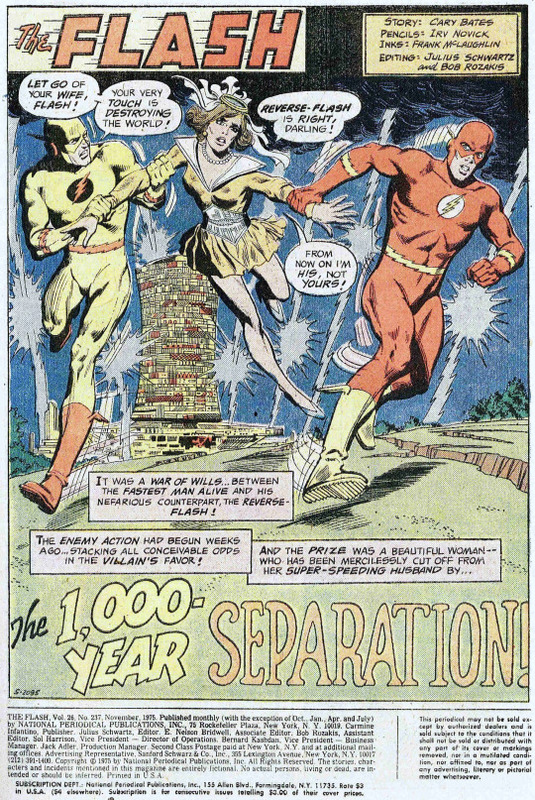 The story picks up where the previous chapter left off, with Flash using his Cosmic Treadmill to try to reach Iris’s future era 1000 years hence. Doctor Fate attempts to stop him from doing so, but he fails, and Flash learns that this is where his wife has been hiding out. But as the Scarlet Speedster approaches at mach-speed, Fate downloads a ton of backstory into his mind. Turns out that Fate had determined that if Flash got too close to Iris, the result would devastate all of time and space! 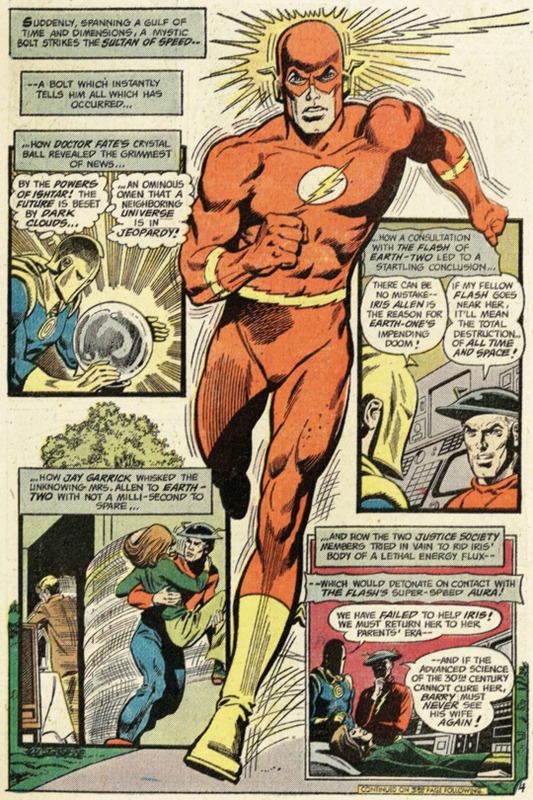 To prevent this, Jay Garrick made off with Iris, and the two heroes have been hiding her ever since, until they can figure out how to fix the problem. And, of course, telling Barry any of this just would have been too straightforward. But Fate’s warning comes too late! Barry gets too close to Iris, even though he tries to avoid it, and disasters break out! The Flash moves to stem the tide of destruction, but it’s the appearance of Professor Zoom that does the trick. Turns out that, while he was trying to kill Iris in his last appearance, Zoom secretly infected her with the energy that causes calamity in the presence of the Flash. Which makes no sense for him to do, but whatever. 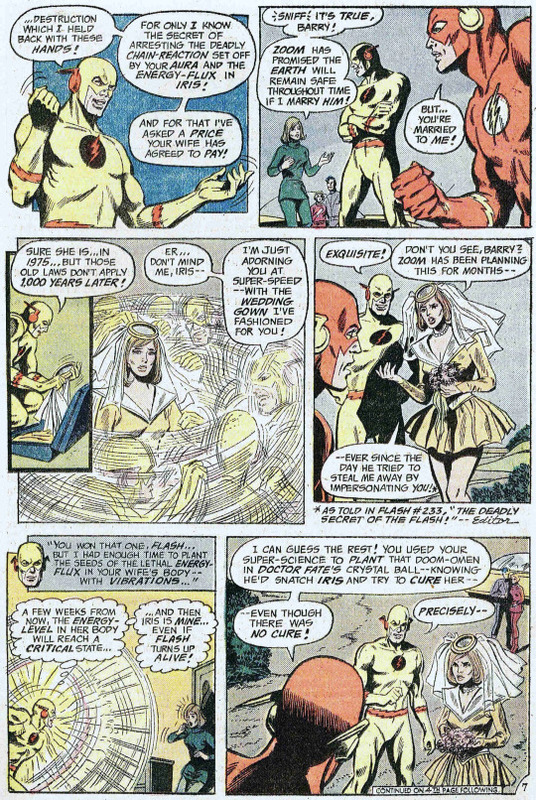 Zoom wants Iris for his own bride, and there’s a really creepy sequence where he dresses Iris in a future wedding gown in the blink of an eye. But Barry isn’t going to take this lying down, and he deduces that the strange hand gestures that Zoom made earlier were really him sending a specific vibration into Iris which neutralized the energy within her. 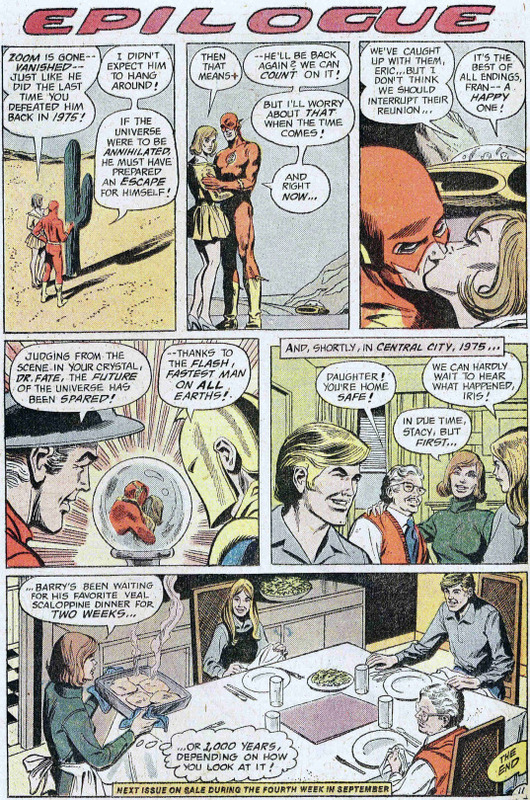 Having figured out how to fix his wife, Flash fights it out with Zoom, eventually defeating the speedy villain. The Green Lantern back-up began a six-part serial of its own this issue, focusing on a band of aliens, the Ravagers of Olys, who were working their way through the biblical story of God creating the universe in six days in reverse. So in this first installment, the Emerald Crusader must rescue the inhabitants of the planet Zerbon, whose world has been plunged into perpetual darkness. 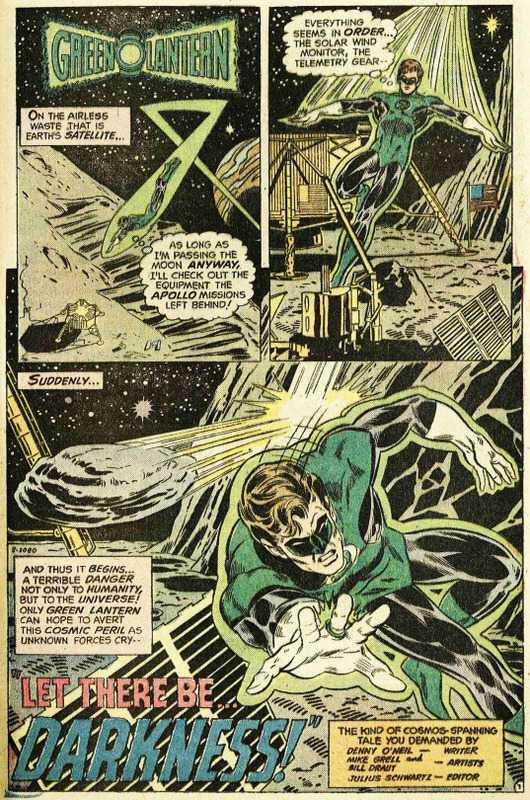 It’s nothing that GL can’t handle, but the aliens responsible escape to move onto their next biblical scheme, with Hal Jordan in pursuit.